G/FORE has unveiled its 2018 Spring/Summer Collection for Women, including several eye-catching additions for golfers looking to add a touch of style to their time playing golf. Among the many highlights is the Two Tone Sweater Polo (£125), the front is constructed from fine merino wool while the back sports delicate nylon yarns, both of which wick away moisture to help keep you dry. The Stripe Super Turtle (£145) became a popular addition to the range but this updated merino wool version, is lightweight and makes the transition between the seasons with ease. When the temperatures rise, the Effortless Skort (£95) features a built-in short with zip-closure side pockets and uses calendered fabric, a process which creates an extra sheen. They are available in the standard 15" length and longer 18" to suit individual preference. The Perfect Fit Stretch Trouser (£125) is extremely lightweight, with a flattering length and available in two colours for the new season, while the popular Sunday Dress (£150) is constructed from an extremely soft and stretchy cotton/nylon fabric, tailored waist and pleated skirt with pockets - ideal for "9 & wine" at the country club. The premium-quality footwear remains a huge attraction and the Brogue Gallivanter Shark Skin (£159) shoes combine an athletic fit in premium waterproof leathers with classic brogue details. Custom designed by G/FORE's team of footwear experts, the Brogue Gallivanter boasts an ultra-lightweight sole coupled with a bespoke cleat design for optimal on-course traction. This shoe also sports a washable and anti-microbial, triple density foam cushion Ortholite sock liner for superior comfort and is worn by LPGA Tour Player Ryann O'Toole among many others. Other new additions to the footwear range include the Brogue Cruiser (£175) and the updated version of the ever-popular Disruptor (£135). To add an extra touch, tassels can be added to any of the brand's shoe styles and comes in scarlet red, twilight blue, snow white, aqua blue and blossom pink (RRP £25). Founder of G/FORE, Mossimo Giannulli, said: "The women's range from G/FORE continues to develop and evolve in an exciting way. 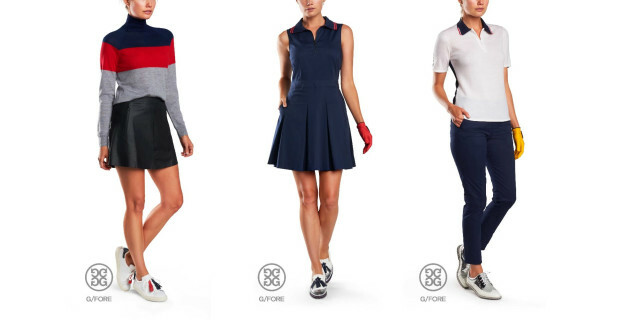 "The G/FORE brand is all about adding some colour and personality to golf and beyond." Aside from the colourful, premium-quality gloves, which continue to earn plaudits, the broad apparel range adds a bright new dimension to the fairway, the clubhouse and beyond. Giannulli added: "At G/FORE, we aim to help someone express their own individuality and style, rather than conforming to the norm and the spring/summer 2018 collection is an extension of that. "The recent deal with Peter Millar means it's a progressive time for the brand to develop as we move into an exciting new chapter." To view the brand's full range of apparel, gloves, shoes and accessories, visit www.gfore.com.